Navy SEALs are a special breed of warrior who conduct special operations in any environment, but who are uniquely trained and equipped to operate from, around, and in maritime areas. SEALs take their name from the environments in which they are trained to operate: sea, air and land. Their small highly trained teams usually work quietly at night conducting some of the nation’s most important missions. SEALs are constantly deployed throughout the world to protect national interests. 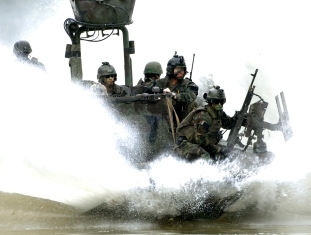 Navy SEALs and their high speed boat driving counterparts, Naval Special Warfare Combatant-Craft Crewmen, form the operational arms of the Naval Special Warfare community, which is headed by the Naval Special Warfare Command. NSW acts both as the Navy’s special operations force as well as the Navy component of the U.S. Special Operations Command, which is responsible for all U.S. special operations forces. Direct Action Offensive strikes against an enemy target using tactics like raids, ambushes and assaults. Special Reconnaissance Surveillance and reconnaissance operations to report on enemy activity or to provide a better understanding of the operational situation. These missions can include tracking of enemy units, monitoring military and civilian activity, and gathering information about beach and water conditions prior to a beach landing. Counter Terrorism Directing action against terrorist groups to prevent terrorist activities. Foreign Internal Defense Training and assisting foreign counterparts to increase their capacity to respond to threats. For more information about the Navy SEALs, their history, missions, and contributions, visit the official website at http://www.sealswcc.com. Information and photos courtesy of the Navy SEALs website.